The shares of independent oil and gas exploration and production company Energean Oil and Gas have begun trading on the Tel Aviv Stock Exchange (TASE) secondary list, the group has announced in a statement. 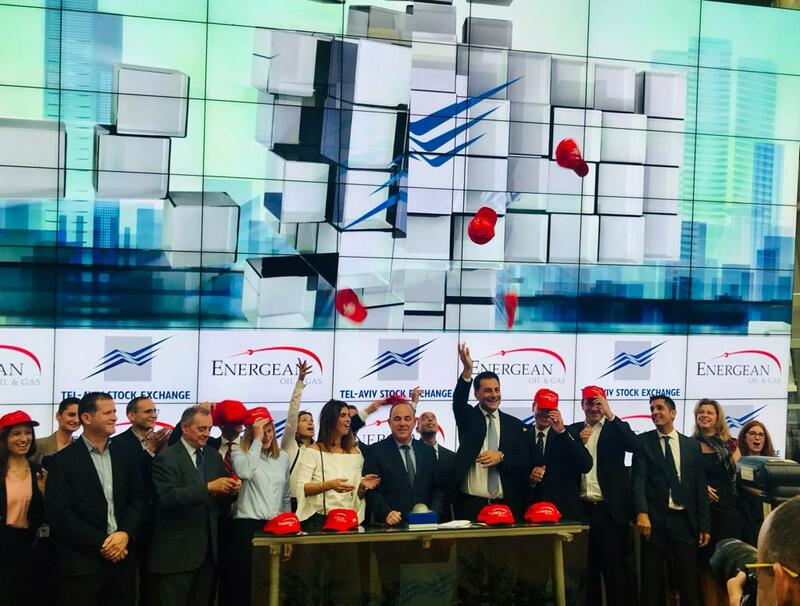 Energean is the first London-listed, international oil and gas operator to list shares on the Tel Aviv bourse, following the largest E&P IPO in London since 2014. Delivery of Energean’s highly attractive, flagship Karish and Tanin gas development, offshore Israel, remains on track for first gas in 1Q 2021 providing energy security and supplying gas to the Israeli domestic market. Energean is currently at the start of an active 18-month period including first steel cut for Energean’s FPSO, the only FPSO in the East Mediterranean, scheduled for 26 November 2018, and drilling of the high potential Karish North well to commence in March 2019, with the potential to de-risk up to 1.8 TCF of resources across Karish North and Karish East. In addition, during this 18-month period, Energean will continue to de-risk its wider Israeli portfolio which has 7.5 Tcf of gross prospective resources across the Karish and Tanin leases and Blocks (12, 21, 22, 23 and 31) and pursue future gas sales contracts, to target both the growing Israeli domestic market and key export markets in the region, with a view to delivering value to all stakeholders. Energean is also focusing on an ongoing investment and development program to increase production from its Prinos and Prinos North oil fields and to develop the Epsilon oil field, located in the Gulf of Kavala, northern Greece. Energean has also reported a significant further upside from its diverse eastern Mediterranean portfolio including exploration and appraisal opportunities in Israel, Greece and Montenegro. “There is strong momentum at Energean as we prepare to begin our active Israeli work program to deliver our flagship Israel gas project which will not only deliver significant shareholder value but provide competition and energy security to the Israeli domestic market. Alongside this in Greece we continue to focus on growing our low cost production. “As such, we are delighted to be the first UK listed international oil and gas operator to list its shares on the Tel Aviv Stock Exchange, fulfilling our commitment that we made to shareholders at the time of our IPO, improving the breadth and depth of the Company shareholder base. “Having Energean in the Israeli Stock Exchange is an important development. It is a positive message to the stock market, but mostly a positive message to the developing energy market of the country, a message that shows that Israel is emerging as a player in the global energy market”. Energean’s secondary listing precedes an operationally active 2019 as it continues to progress its flagship gas development on track for 1Q 2021 and the wider Israeli portfolio which has 7.5 Tcf* of gross prospective resources across the Karish and Tanin leases and Blocks (12, 21, 22, 23 and 31) that were awarded as part of the recent offshore licencing round. Energean will kick off its 2019 campaign with the drilling of the high potential Karish North well in March which has the potential to de-risk more than 1.8 Tcf** of resources across Karish North and Karish East and is in line with the company’s strategy to target near field prospects where potential discoveries can be quickly, economically and safely monetised through its offshore FPSO. Following Karish North, the Stena DrillMAX will drill three development wells into the Karish Main structure. These three wells will be the producers that deliver 4.2 bcma of gas sales into the Israeli domestic market from 1Q 2021. Energean is building its FPSO with a production and processing capacity of 8 bcma and first steel cut is planned for 26 November 2018. Current gas sales contracts, which account for all of its existing discovered resource, underpin the 4.2 bcma of firm contracts signed to date, leaving 3.8 bcma of spare capacity for the tie-back of additional discoveries. Future gas sales contracts will target both the growing Israeli domestic market and key export markets in the region, with a view to delivering value to all stakeholders. Energean has a strong environmental track record and working successfully with local communities, The company has over 37 years’ experience of working safely in environmentally sensitive locations in NE Greece and is focused on transferring this safety and success to all areas where it is present. As the first operator of a FPSO in the eastern Mediterranean, Energean is committed to the safe production of hydrocarbons in Israel as well as being focused on leaving as little environmental footprint as possible.